Have a question on Range Rover Evoque 5 Door? Range Rover Evoque 5 Door is available in 11 different colors - Indus Silver, Kaikoura Stone, Santorini Black, Firenze Red, Fuji White, Corris Grey, Loire Blue, Yulong White, Silicon Silver, Carpathian Grey and Narvik Black. Watch latest video reviews of Land Rover Range Rover Evoque 5 Door to know about its interiors, exteriors, performance, mileage and more. The Range Rover Evoque is the only compact luxury crossover that is more oriented towards elegance over complete strength, and pretty much the only drive from the house of Land Rover at that. With over 65 years of experience in presenting some of the best all terrain expertise vehicles across the globe, the British car manufacturers has designed the car to make a perfect amalgamation of luxury and thrill. Developed on the LRX concept for achieving the goal of more environmentally conscious vehicle, the car is all set to please the customers of UAE and enhance the market share of the company. Range Rover Evoque features a suite of latest technologies within the cabin that adds to the comfort of the occupants. Plenty of options to choose from, each color trim option will give you an ultimate ambiance. 380 watt Meridian sound system delivers a refined and quality sound. The 11 speaker sound system including sub-woofer transforms the cabin into a concert hall. An 8-inch touchscreen in the middle act as an interface for the infotainment and two screen on the head rests further adds to the entertainment as well information of the car in an efficacious manner. The Standard load space of 575-litres offered by the Evoque could be increased to an enormous 1445 litres by folding the rear seats, making enough room for luggage. The striking lines, muscular shoulders and tapered roof, makes Evoque Coupe apart from the contemporaries. The innovative Xenon lighting with LED signature, the new sleeker wing mirrors and the full side panoramic roof all adds to the elegance of the exteriors. Considering five -door Evoque, the same athletic design with unparalleled accessibility gives it all the capabilities to match your needs. The overall dimensions of the car measures 4355 mm X 2085 mm X 1605 mm (L X W X H) and the wheelbase measures 2660 mm that gives significant cabin space and stability to the vehicle. The options of (19/20/21/22) inch alloy wheels are available that further adds character to the side profile in an effective manner. 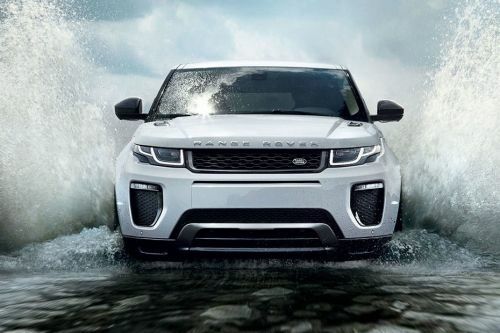 The Range Rover comes in two variants namely Range Rover Evoque 5-door and Coupe. Both of these variants come in two trim levels namely Pure, Dynamic, Prestige and Autobiography. Lightweight all-aluminium technology with new 9 speed transmission all together enhance the performance of the engine employed in Evoque. The 2.0-litre Si4 Petrol engine (also available with 2 diesel variants) delivers maximum power of 240 PS at 5500 rpm along side maximum torque of 340 Nm at mere 1750 rpm. The small engine size does not compromise the speed and one can attain 0 to 100 kmph mark in a time span of 7.6 seconds and the top speed measures 217 kmph. The new Evoque is efficient and the fuel economy measures 8.3 L/100 Km that is quiet significant for the segment. The braking system of the Evoque accommodates ventilated disc type at the front and solid disc type at the rear that are further coupled with Anti- Lock Braking System (ABS), Electronic Brake Force Distribution System (EBD) as well as Brake Assist (BA) to provide effective braking. The Terrain response feature in the car allows it to encounter off-road tracks with ease and adds to the improved handling of the car. Airbags and restraint system ensures maximum safety to all the occupants by offering-knee airbags, side curtain and thorax airbags. Some of the other safety features include seat belt reminder, hazard warning lights, engine drag control, trailer stability assist, traction control and Hill Start Assist (HSA). Dynamic looks and luxurious interiors of the crossover give a stand out option to the customers to choose. But, the cramped rear seats and reduced overall height might create hindrance in the overall thrilling experience of the occupants. What is the price of Land Rover Range Rover Evoque 5 Door? On road prices of Land Rover Range Rover Evoque 5 Door in starts from AED180,700 for base variant 2.0L Si4 Pure AWD, while the top spec variant 2.0L Si4 Autobiography AWD costs at AED275,900 . What are the colors options available in Land Rover Range Rover Evoque 5 Door?